Brazilian Jiu-Jitsu is a popular competitive martial art and self-defense system focused on grappling and ground combat. It is unique amongst other martial arts in that it focuses on ground fighting almost exclusively, even more so than other ground-focused disciplines such as Judo and wrestling. By taking a fight to the ground and eliminating the advantage of longer reach and greater physical strength, a skilled practitioner in Brazilian jiu-jitsu can easily overcome a larger opponent. If you are a newcomer to the world of Brazilian Jiu-Jitsu, your first visit to the Academy of Combat Arts will be an introductory session to show you around our facility and demonstrate some basic techniques. When you begin regularly attending classes, you’ll find yourself surrounded by supportive students who were once beginners as well. We strive to maintain an atmosphere free from egos and intimidation. More than just a martial art, Brazilian Jiu Jitsu is an excellent sport for both competition and physical fitness. Training in BJJ builds confidence, develops discipline, and promotes a positive attitude. The quality of our BJJ instruction and the supportiveness of our martial arts family are unparalleled in the region. We welcome both total beginners looking to get into BJJ and veteran experts looking to refine their skills with equally open arms. Our gym also features top-notch facilities, including spacious floor space for training, and both a full ring and cage for competitive sparring. Several of our students have gone on to compete and win at the national level, proving the quality of our teaching and the caliber of our instruction. No one in the Fargo-Moorhead area provides more expert training in Brazilian Jiu Jitsu than the Academy of Combat Arts. Come learn this complex and highly rewarding martial art with top trainer Dylan Spicer and other dedicated students as committed to excellence as you are. We welcome men and women of all ages, regardless of experience level, to enjoy mastering the art of BJJ with us. 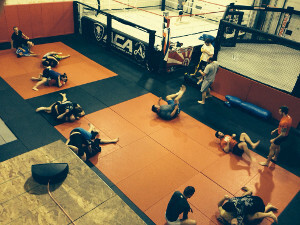 Interested, but not totally sure if training in Brazilian Jiu-Jitsu at the Academy of Combat Arts is for you? No problem. We offer all new students a free 30-day trial to test out our program before committing to either a six or twelve month contract. You’ll get the full ACA experience so you can best determine if you’d like to continue our program with zero financial obligation. If you decide to stick with us, you’ll be warmly welcomed into the greatest martial arts family in the Fargo-Moorhead area. Sign up here to get 30 days of free BJJ training at the Academy of Combat Arts.